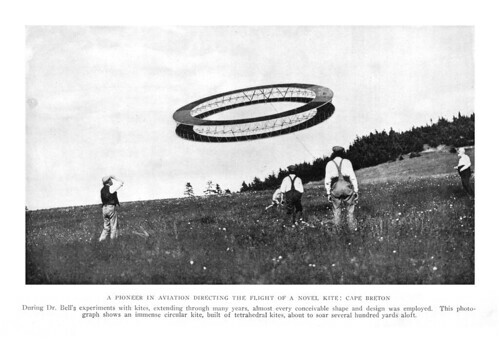 I recently reported that The Best Laid Plans was going to be made available as an ebook. 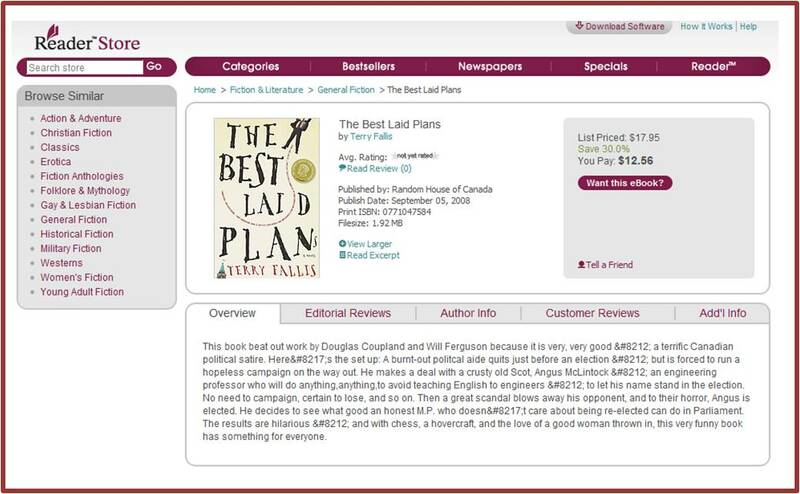 Well, TBLP has just now appeared in the Amazon Kindle store and in the Sony Reader store. It has yet to appear in the Kobo ebook store here in Canada but it shouldn’t be too much longer. 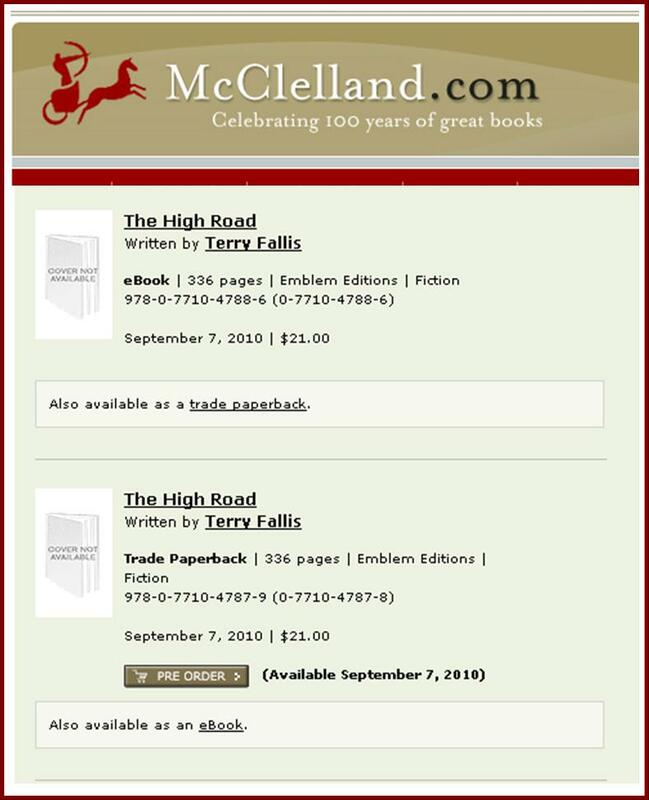 When The High Road is published in early September, it will be available right out of the gate in print and electronic forms. However you read it, I hope you enjoy it. TBLP doesn’t generate a ton of reader reviews on Chapters-Indigo or Amazon but it’s sure nice to get them, particularly if they’re positive. I don’t know about you, but I always scan the reader reviews before I buy a book. they’re often more meaningul to me than the Globe and Mail or New York Times book reviews.Â I read as a reader, not as a reviewer. Authors write to have their work read. So hearing nice things from actual readers is just so gratifying. 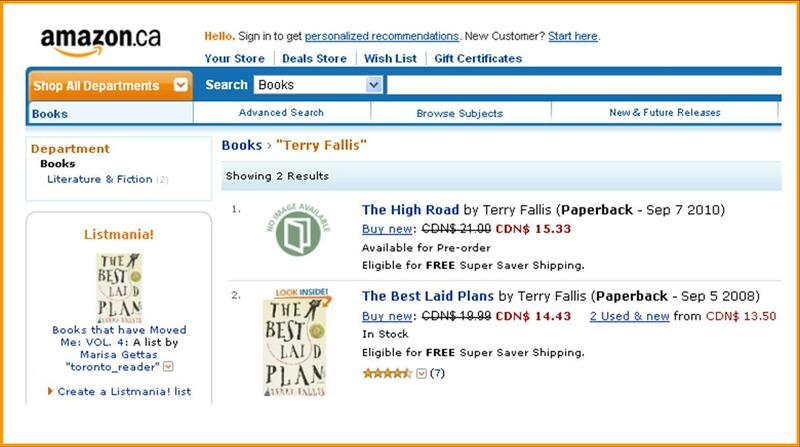 I happened to check last night and the seventh TBLP reader review has just appeared on Amazon.ca. 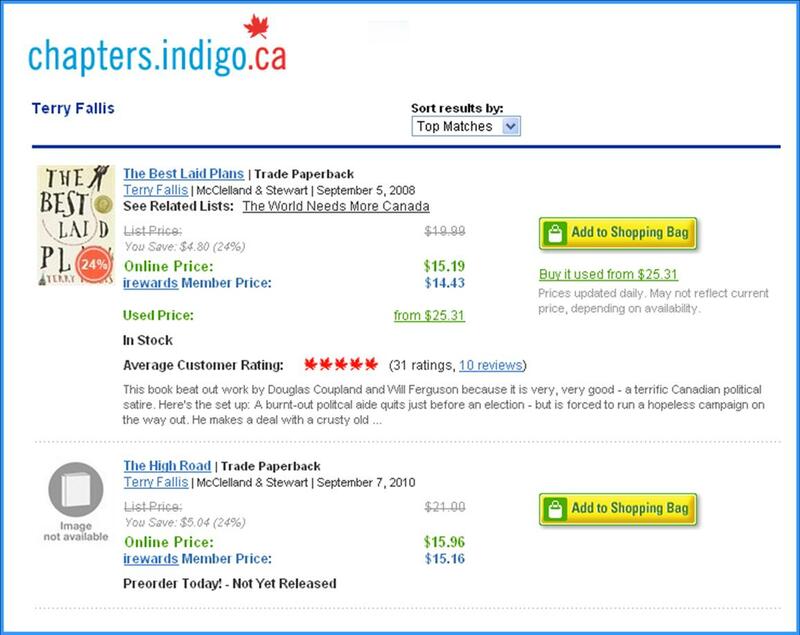 I’d never actually noticed that you can check sales rankings on Amazon.ca based on the category in which the book has been placed.Â TBLP is categorized as Literature and Fiction/Genre Fiction/Political.Â When I realized this, I had a quick look at the Political genre Bestseller list and much to my amazement found TBLP at number seven, just ahead of Dan Brown’s Digital Fortress at number eight.Â Who knows how Amazon determines the rankings, but it’s still neat to be anywhere near such a list. 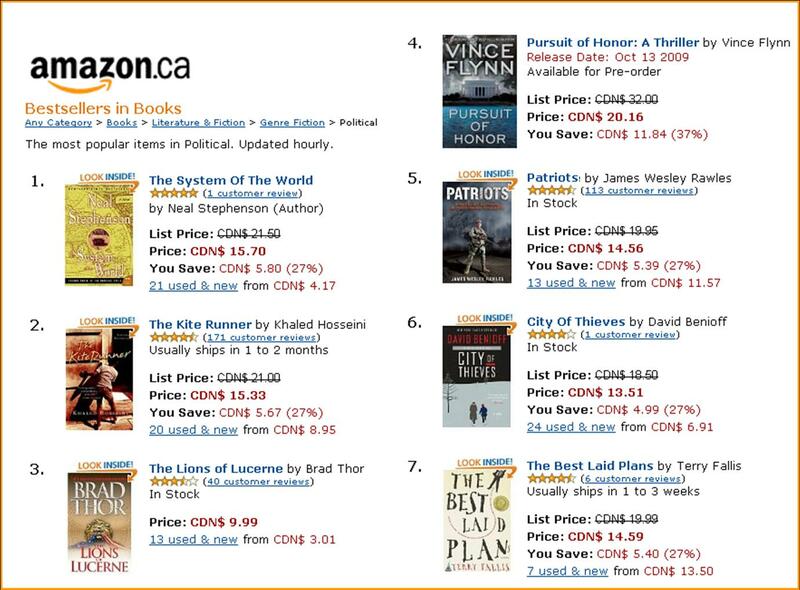 Amazon.ca updates their bestseller lists hourly, so I took a quick screen shot in case I never crack the top ten again. 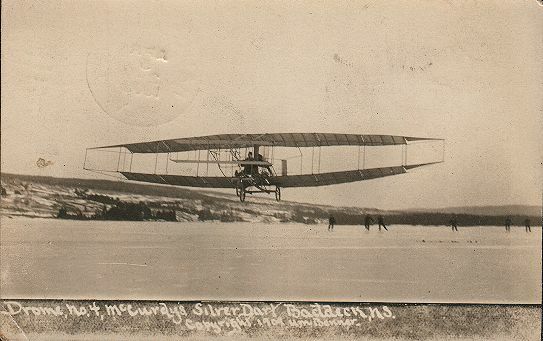 If you’ve read TBLP, you’ll know that I’m a big fan of Alexander Graham Bell.Â In the novel, Angus reveres Bell and honours him by naming his hovercraftÂ Baddeck 1.Â Bell summered in Baddeck in Cape Breton, Nova Scotia.Â It was the site of many of his triumphs as an inventor.Â Whether building his record-breaking hydrofoil or testing various kite designs, a whole lot of ingenuity and innovation unfolded on the shores of Bras d’Or Lake.Â On February 23rd, 1909, the Silver Dart, a rickety plane of bamboo, string, wire and silk, lifted off the ice at Baddeck making the very first controlled, powered flight in Canada.Â The Silver Dart was designed and built by the Aerial Experiment Association, a group founded by Alexander Graham Bell in 1907.Â One hundred years later, almost to the day, a replica of the Silver Dart flew again, taking off from the very same ice.Â Aided by my interest in, and respect for, Bell, I found the re-creation of this historic first flight to be quite moving.Â It was a fitting and worthy tribute to Bell and his team of intrepid adventurers.